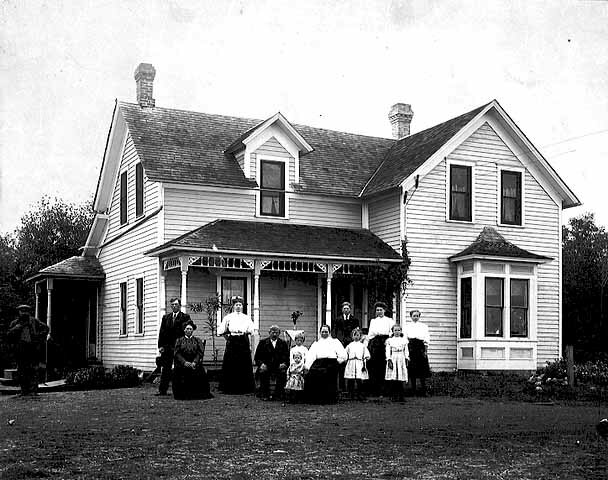 This picture shows Peter Roggenbuck Family in front of their home in Walter Township / LQP Co. / Minnesota in about 1910. At left, unidentified man. Back row, left to right: Bill Nitz, Mary, Albert, Mathilda, Frances. Front row, left to right; Martha (Roggenbuck) Nitz, Peter, John (standing behind George), Maria, Pauline and Amanda. Photograph is supplied by a relative, thanks to Tammy and also thanks to Ray who helped in identifying pepole on the picture.